The scene is familiar to sports fans who keep an eye on the sidelines. An athlete is pulled out of a game, and a team physician is face-to-face with him, asking questions and running tests. Minutes tick by, and the athlete gets back in the game, only to come out after another hit for more tests. Is it a concussion or just a really hard tackle? In the internet of things, the answer will be instantaneous and leave no room for guessing. University of Florida researcher Y.K. Yoon has developed the first internet of things device that works inside the human mouth. It’s a mouth guard that measures three components of athlete health: head impacts, heat stress and heart stress. He calls it H3, and it comes complete with sensors and Bluetooth. 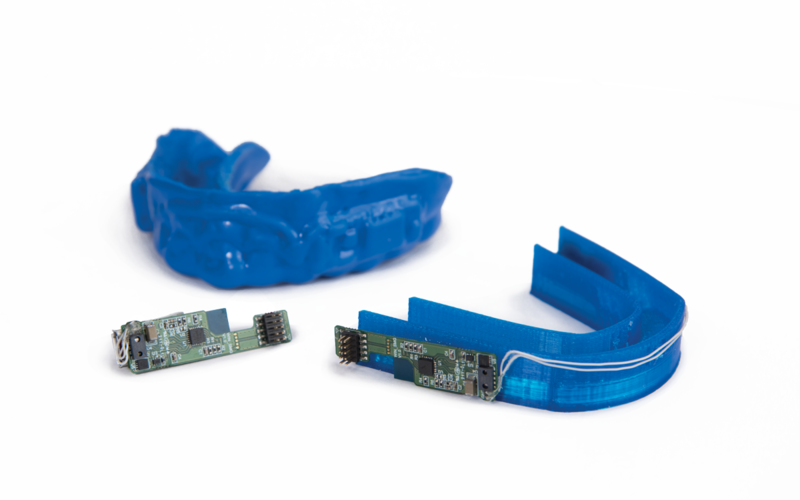 In the mouth guard’s current form, Yoon and doctoral researcher Todd Schumann used an everyday sports mouth guard and inserted a tiny chip with sensors on the side, where the mouth guard meets the gums. They covered the chip with a layer of biocompatible elastomeric polymer for comfort. The chip has 11 sensors, including an accelerometer to measure impact and a gyroscope to measure the rotation of the head. Another sensor measures temperature and still another heart rate. In one design, the device remains in a low-power state until the athlete shakes it, which “wakes up” the sensors. Another design relies on a magnet to wake up the microcontroller. Once it’s turned on, the sensors begin collecting data, which the microcontroller sends to an app, which can be installed on a cellphone, tablet or laptop. Trainers and coaches can roam the sidelines, keeping an eye on the app. A spike on a graph means a nasty collision, a high body temperature reading could mean it’s time for a water break. While football players have had access for several years to helmets with impact sensors, Yoon says the helmets can have enough of a gap between the helmet and the head to distort the sensors’ readings. A helmet could shift back slightly, while the head moves forward just a little. 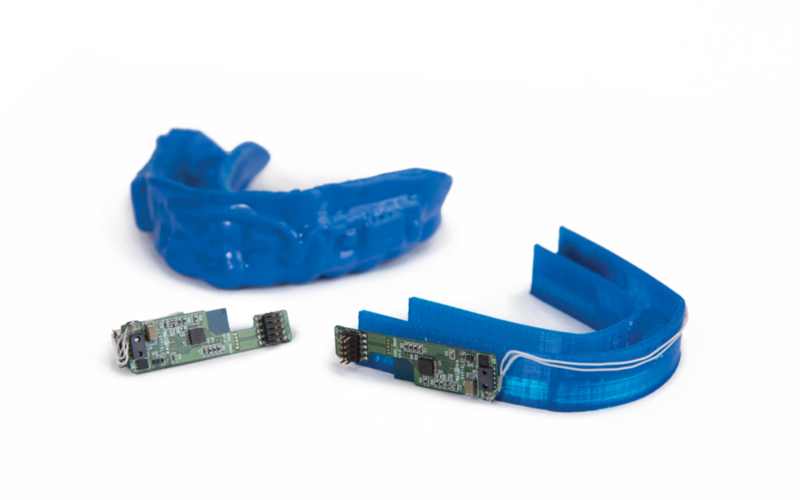 A mouth guard is more tightly fitted, so it can give a more accurate real-time reading. The mouth guard also can be used by athletes, such as soccer or basketball players, who do not wear helmets. Schumann says he tested the mouth guard on a treadmill and found other interesting data. The sensors could detect whether he was stepping with his right foot or his left, something that might be interesting to examine for gait analysis. Yoon, a native of South Korea, says the mouth sensors also might have applications for linguistics, because they can detect differences in tongue movements that affect how words are pronounced. Koreans, he says, don’t distinguish between a “p” sound and an “f” sound, but a sensor can detect that issue and improve pronunciation. For sports uses, the protective function of the mouth guard remains important. But in other uses, such as linguistics or gait analysis, the mouth guard could be made very small, only as big as it needs to be to hold the chip. The sensors could even be attached to a tooth, Yoon says. So far, their prototype focuses on physical sensors. But already, Yoon says, he sees applications for using the IoT mouth guard with biochemical sensors since saliva offers a wealth of information. 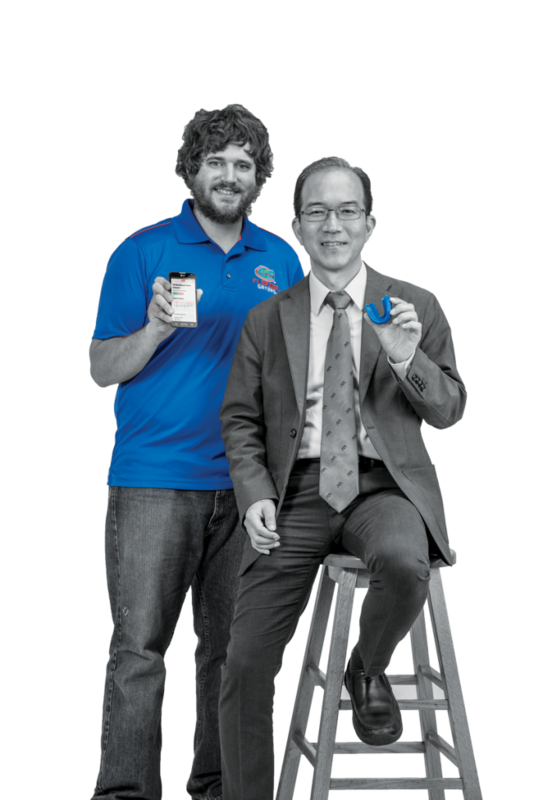 Yoon says mouth sensors could monitor blood sugar or detect disease. Saliva also is a unique signature that keeps the data linked uniquely to the person generating it. That means an athlete yanked from a game after his mouth guard indicates a concussion, for instance, cannot use a teammate’s mouth guard to get back in the game. You can’t fool the IoT mouth guard.